This post is coming from someone who’s been thin to the point of resembling a skeleton more than a healthy human being, to later becoming a strong figure athlete and feeling on top of the world, to then slowly gaining back 25 pounds post-show and wondering how to deal, to now finding balance in the in-between. When it comes to self-love and forgiveness, being on each end of the spectrum (both physically and mentally) has given me a great deal of insight into how it affects our actions towards ourselves. Even if your dislike towards yourself stems from other insecurities or faults you assume yourself to have, whether it be, your hair, your large nose, your ability to always make a fool of yourself, your laziness, your lack of self-discipline etc. This article can still help to conquer any impeding resentments you have, if you are open and listen to the concepts presented. Loving yourself is the greatest gift you can give to not only you, but also the universe that sits still, calmly awaiting the arrival of the vast greatness you have yet to tap into. Give-up the concept of perfection (OR at least change it’s meaning). You’ve probably heard it a million-and-one times, “nobody’s perfect!” and that’s true, but what’s more accurate to say is that we are actually ALL PERFECT in our own ways. OK, OK, I get it, majorly cheesy. But hear me out..
Do you know anyone that talks like you? Has the same hair as you? Has the same name as you? But do you know anyone who talks like you, has the same hair as you, has the same name as you, has the same job as you, has the same number of siblings as you, has the same weight as you, has the same skin and eye colour as you, has the same personality and feelings towards life as you, has the same goals and ambitions and ideas to bring to the world as you do?? Likely not. Actually, definitely not. Because YOU ARE THE ONLY YOU. You are the only you that IS and EVER WILL BE. You were made unique for a reason. So ask yourself again, what is perfection? To most it’s looking like someone they idolize, changing themselves to match an unrealistic standard and/or living the exact same life as someone they are envious of. What would our world be if everyone looked the same, thought the same, talked the same, had all the same ideas and goals? We’d be a pretty dang, BORING world if you ask me. The reason we have things like electricity, bridges, boats, cars, airplanes, art, music, dance, sports, clocks, computers, phones, ovens, blenders, heck even fidget spinners (did I really just say that?) is BECAUSE these people all thought outside the box, acted different than people around them and SET THEIR SELF APART. Sure maybe there were some people who questioned them or thought they were crazy in the beginning (these people often being family members and/or close friends), but in the end, you know what? Every one of those people wanted to be like them or even more, wanted to be them. So when you go about your life trying to lose weight to look like a certain celebrity, give-up your dreams and ambitions you once pursued to fit into the norm or be more “realistic”, or change your entire wardrobe just to look like Dolly Parton (ok, maybe that one’s a stretch but you never know?). Just remember, you are giving up this wonderful, amazing, one-of-a-kind creature that is YOU to attain the image or life of someone else, WHICH if you haven’t already figured out, is IMPOSSIBLE because they themselves are already the most perfect version of them that will ever be. 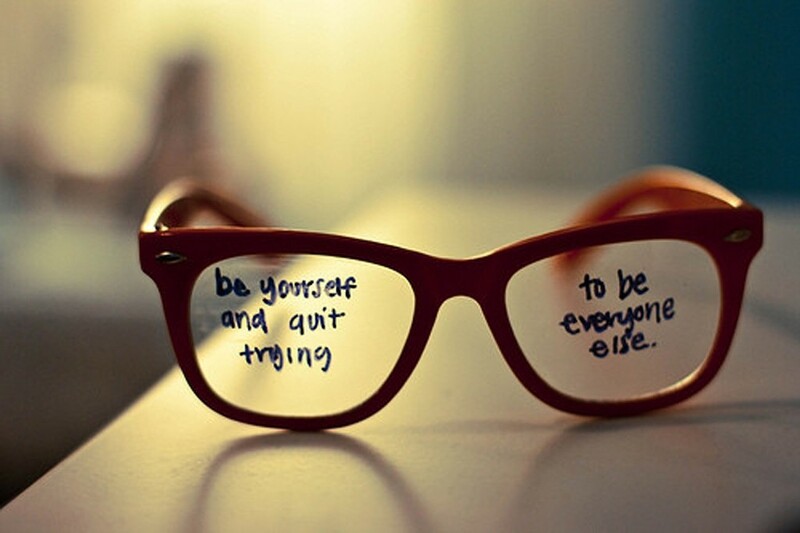 Don’t try to be someone else’s perfect because you will always fail. Unforgivably, un-apologetically, genuinely YOU everyday from now on. Whether you want to be a writer, an inventor, an entrepreneur, a chef, a barney impersonator, a teacher, a swimmer, a coach, a lion tamer or a singer on broadway – YOU NAME IT. You NEED to do and be what you were put here on this planet to do and be. You are unique and perfectly YOU for a reason.